My absolute, all-time favorite holiday dessert is pecan pie. I think that’s why the Universe made me allergic to all nuts EXCEPT pecans, so I could fully appreciate and savor the deliciousness that is known as pecan pie. What’s even better than a pecan pie?? My own mini-pecan pie in the form of a tart. Am I right?? 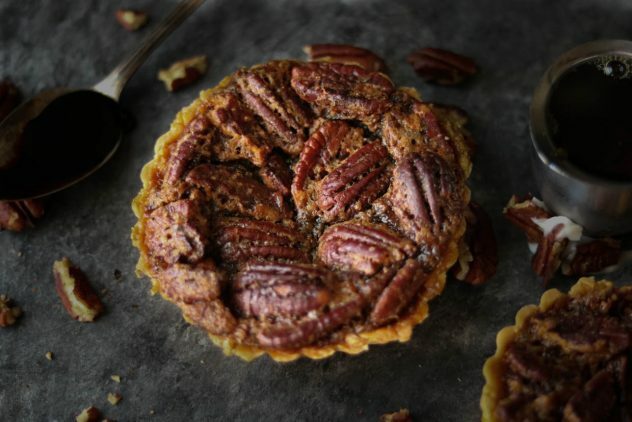 And if I’m being totally honest, I really just love the guts of a pecan pie so I mean if I could get away with making a pecan pie minus the pecans, I’d be in heaven! 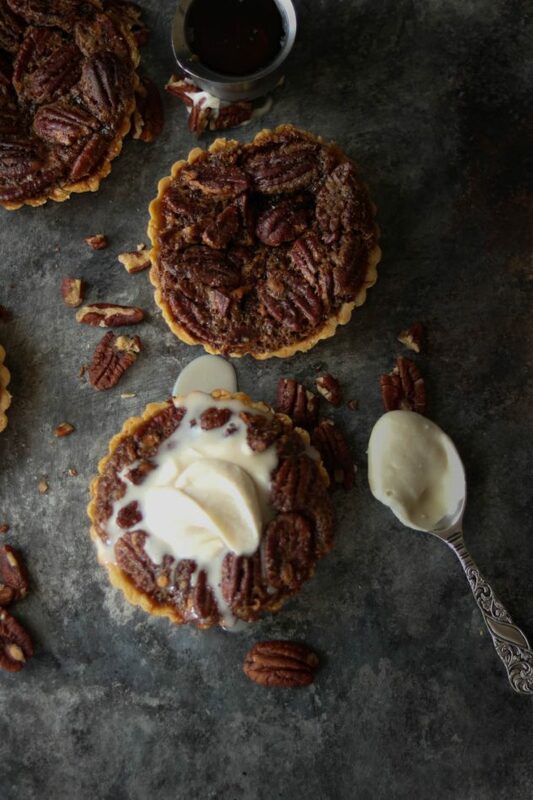 I even made these individual pecan pie tarts gluten-free for my fellow gluten-free foodies. If you don’t require gluten-free, feel free to substitute in your own pie crust recipe. This recipe is actually a family heirloom, passed down to me from my great-grandmother. It’s so interesting to me to read how recipes from decades ago were written. On this particular recipe she noted using a walnut sized amount of butter. I’m guessing butter back then didn’t come packaged in nice, neatly wrapped packages with measurement markings on the paper. This traditional recipe also used Karo syrup which doesn’t include the best ingredients. So I ventured out to adjust the Karo syrup for something a little less chemically laden, but not necessarily less in sugar content. I mean, it’s pie. I also topped these individual tarts with a maple coconut cream. You can use your cream topping of choice, but this is my go-to anytime I fix dessert. It’s a super easy, dairy-free choice. Note: I played with my photography this time around. I absolutely love the dark, shadowed, brooding food photos I see floating around Instagram. I still have a LONG way to go, but it was fun playing with these photos. Top 10 Most Saved Recipes FREE eBook!! 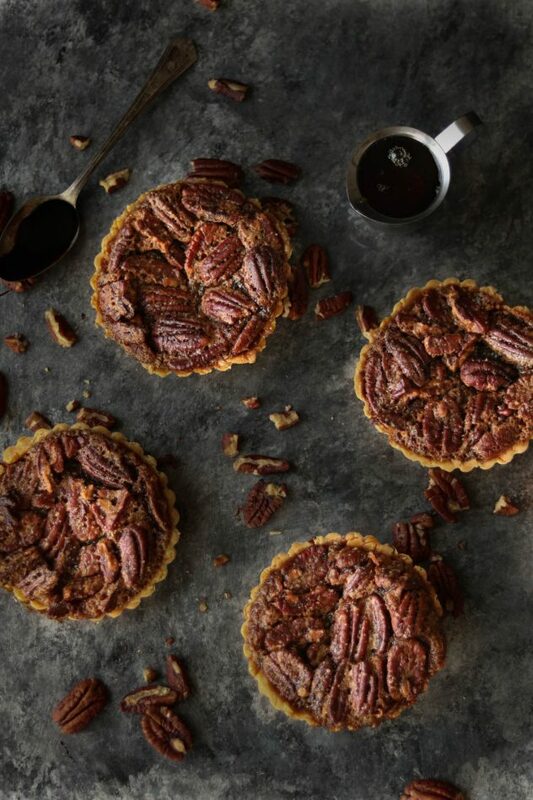 Add these Gluten-free Pecan Pie Tarts to your Thanksgiving Meal Plan! Grab the full Wanderlust and Wellness Meal Plan HERE. What’s better than a full pecan pie?? 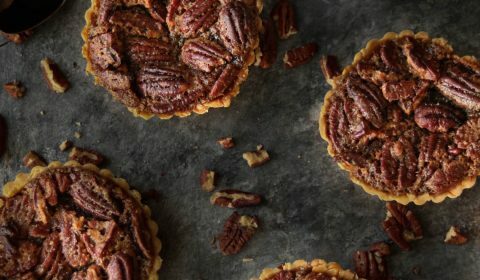 Individual pecan pie tarts! In a large bowl, combine the gluten-free flour, salt, and baking powder. Using a pastry cutter or fork, cut in the palm shortening until the mixture becomes crumbly. You don’t want large chunks of shortening, the texture will be similar to sand. Stir in cold water. Start with 6 tbsp. of cold water and begin mixing until dough forms. If it appears too dry, add in a slight bit more cold water but you don’t want the dough to be too wet. Then, form dough into a 4 equally sized balls, wrap in plastic wrap and place in the refrigerator to chill for 10 minutes. In another bowl, add the eggs and whisk, then stir in the remaining pie filling ingredients. Remove dough from refrigerator. Lay out one sheet of parchment paper and dust with flour. Place one of the dough balls onto floured parchment paper. Place another sheet of parchment paper on top and, using a rolling pin, roll out crust until you have about a 5 in. circle. 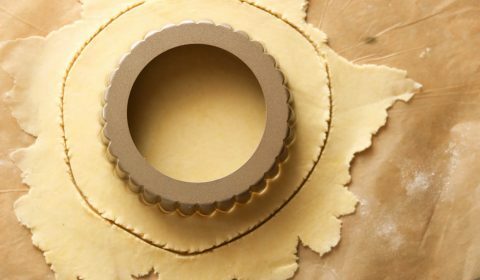 Lay the individual tart pan onto the dough and cut out a circle one inch from the sides of the pan. Continue this process for all four tart pans. Place tart pans onto a baking sheet. Stir the filling, then pour into the four tart pans, filling to the top. Cook for 45-50 minutes. Remove from oven and let cool. While tarts are cooking, make the maple coconut cream. In a small mixing bowl, add all cream ingredients and blend with a hand mixer. Cover and place in refrigerator until ready to serve.